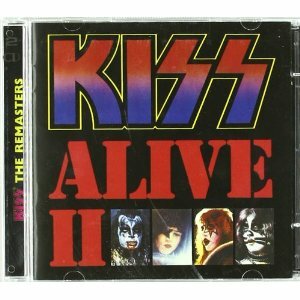 Kiss Alive 2 is the second live album by Kiss, recorded in 1977 with songs from Destroyer, Rock and Roll Over and Love Gun. The performances came from The Forum, Los Angeles, Capital Theatre, Passaic, New Jersey and Budokan Hall, Tokyo, Japan. I remember reading the reviews in the Sounds music paper by Geoff Barton where he raved about it and said that it was even better than Kiss Alive! and he loved that first album. This set list doesn’t duplicate any songs from their first live album – Kiss Alive. Instead we have five songs from Destroyer (1976), five from Rock and Roll Over (1976) and five from Love Gun (1977). We also have five new studio recordings. This is a bit odd because it doesn’t represent a real concert recording. This album captures Kiss doing what they do best – playing high energy rock songs live in front of an audience that loves them. I struggle with this album more than the original Kiss Alive even though these songs comes from albums that were much more successful. The addition of the studio tracks gives more value but excluding the tracks from the first live album stops Alive 2 being an accurate representation of the concerts. It’s good but it will always stand in the shadow of the first live album. Buy Kiss Alive! and if you love that, come back for this second helping. How well does this compare to Kiss Alive! Is this the best live album by Kiss? To help find the best live albums, I use readers polls. This entry was posted in 1970s Live Albums, Heavy Metal Live Albums and tagged 1970s hard rock, 1977 live albums, Heavy Metal 1977, Kiss Live Albums by Paul Simister. Bookmark the permalink.